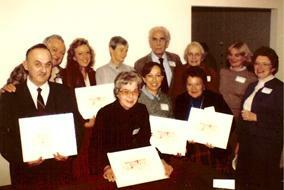 1985: Founding Members receive architectural rendering of Metlar’s Group Home, our first residential program. Among the members pictured above include: Allen Stearns, Mr. & Mrs. Troisi, Nancy Schneeloch (1st Group Home Manager), Philip Vinick and at center: Dorothy Frownfelter, Elena Stolzer and Dorothy Ambruso. Dorothy Ambruso, a trailblazer in community mental-health and supportive housing, passed away June 16, 2008 at Somerset Hospital. Born in Hershey, Pennsylvania, she moved to New Jersey as a teenager, residing in Middlesex, Morris and Somerset Counties. Dorothy Ambruso made it her life’s work to promote and develop quality housing for individuals afflicted with serious and persistent mental illness. Dorothy was a leader in developing transitional programs for the mentally ill, which enabled them to become successful members of the community. Ms. Ambruso lived her life contributing to the de-institutionalization movement within the State of NJ, and did so without fanfare. She genuinely sought to improve the quality of life and living standards for former patients returning to their communities. With undaunted effort, exceptional determination and little fanfare she achieved great success. Determined to make a difference, she led in the founding of CCCPA (now known as Triple C Housing), a non-profit supportive housing organization dedicated to improving the lives of people afflicted with mental illness, and to offer support to their families and friends. She was the President of the organization for 10 years. Ms. Ambruso also founded and volunteered with CCCPA Alliance for the Mentally Ill (now known as the National Alliance for the Mentally Ill-Middlesex Chapter), dovetailing her efforts to involve family in the recovery of their offspring, and to contribute to their wellness. In 2000, CCCPA split into what is now Triple C Housing and NAMI Middlesex, which is the support group for families. Dorothy was devoted to NAMI to the day she died. She believed that families of the mentally ill needed to form a bond of mutual support. Serving in the capacities as a founding board member, president and then CEO of Triple C Housing, Ms. Ambruso was the first to develop consumer operated Supportive Housing within Middlesex County in consultation with Monarch Housing Associates, garnering the support of the US Department of Housing and Urban Development and the NJ State Division of Mental Health Services. Always one to take the bull by the horns, she never stopped to think about whether or not to pursue another opportunity to develop housing; she pressed on knowing the tremendous need that existed within the State. In the 1980’s, Ms. Ambruso helped psychiatric patients return to, and remain in, their communities before it became a popular goal of the mental-health community to place individuals in residential care settings and more so, in supportive housing, to ensure people lived with dignity. She developed Supportive Housing and saw it as responsibility to fulfill the basic needs of our most vulnerable citizens, and to lift up their lives. Dorothy made an enormous difference in the lives of people with disabilities. Her leadership and achievements were recognized at conferences by former New Jersey Governor Christine Whitman and former First Lady Rosyln Carter. In addition, she served as president and vice-president of Senior Citizens of Hillsborough. In 2014, Elena was awarded the Family Legacy Award of Excellence in recognition of advancing Triple C’s mission. For close to 40 years, Elena has supported Triple C as a founding family member and family advisory member. Elena and her late husband were one of the very first families that bonded with others sharing the same intention of finding support during their son’s first episode of hospitalization for mental illness. As Elena recalls, it all started when their son, Marc, was at Penn State University and had to take a leave because his symptoms surfaced. The symptoms were the start to discovering that he was experiencing a mental health episode. They eventually took Marc to NYU Medical Center and from there, upon his discharge, it was recommended he attend the day program at The Club in Piscataway. The Club connected Elena and Allan with a group of parents who were just beginning to get together to support one another. After organizing themselves, they decided to create and incorporate an organization to support families and their offspring afflicted with a mental illness to cope with the trauma and stress associated with such a debilitating illness. They named the organization Concerned Citizens for Chronic Psychiatric Adults (C.C.C.P.A.) because at that time, the families wanted people to understand that there was a difference between “the worried well” and the seriously mentally ill. They were family members who were passionate about helping one another. With the support of wonderful staff, they set up the monthly Coping sessions, where family members got together and really helped each other discuss various issues and problem solve. They then decided that housing or the lack of housing for people coming out of mental institutions was a crucial situation so it was decided to put up capital donations and purchase the first house on Metlars Lane with 24 hour support. It was important for people to know that this was their permanent residence-not a temporary stay. After a period of time, the family members realized they needed more than volunteers and a small staff to operate the housing, and partnered with the State of New Jersey Division of Mental Health. Once the services were contracted, C.C.C.P.A. expanded to provide semi-supervised housing, and eventually, supportive housing. Since 1979, the organization grew from serving 5 consumers at one group home location, to now serving over 250+ family members across three counties. Without the initial support of the family members, and their courage and compassion to build an organization rooted in the family values of helping one another, Triple C would not exist. It is with thanks to Elena and Allan Stolzer for building this foundation that continues to fortify the efforts and endeavors to this very day.